Living in Anchorage, AK has many benefits. Being off the beaten path allows for a connection with nature that most people don’t get to enjoy on a daily basis. From beautiful scenery to a sense of community that is hard to find nowadays, Alaska has much to offer. 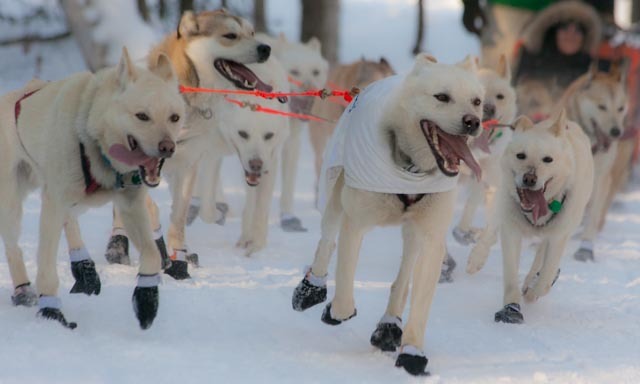 But perhaps one of the best advantages of living in Anchorage is the ability to engage in fun and unique hobbies and sports, such as dog sledding. If you’ve been thinking about getting into dog sledding, or you just want to learn more about it, you likely have many questions. Below is a brief guide on the basics of dog sledding in Anchorage. Dog sledding is a sport and hobby which involves hooking up sled dogs, usually huskies, malamutes, or other similar breeds, to a sled which is ridden by the dog sledder. The dogs lead the sled through outdoor excursions, usually through the woods, along creeks and rivers, and through the rugged terrain of Alaska. While this was at one point simply a method of transportation for Alaska’s ancestors, it is now a full-fledged sport. Dog sledding is a lot of fun for many reasons. One aspect of it is being in the outdoors and being in tune with nature. By getting out into areas that are largely uninhabited, or at least quite far from the nearest town, you can relax and unwind. Another great part of dog sledding is that you don’t necessarily have all the control. While the dogs are certainly trained to obey, you’re still being powered through the wilderness just by the power of living creatures, which is amazing and very humbling, as well. On top of all these things, dog sledding unites you with a community of people who are passionate about the sport, and you get to honor the cultural roots and traditions of Alaska’s past, as well. The mother of all dog sled races is the Itadarod Trail Sled Dog Race, which is over a thousand miles of pure nature and adventurous fun. But, to start out, you can visit one of the following companies and tour groups. From cruises to tours to dog sledding, this company does it all. Group 3 focuses on helicopter tours and other outdoor excursions, including dog sled tours. Pricing varies. Complete with warm and comfortable cabins, couple’s retreats, and other unique amenities, this group focuses primarily on dog sledding and dog sled tours. Prices vary. Fortunately, you don’t have to have your own dogs or equipment to get started, as most tour and training companies will allow you to rent these things. All that is truly required to get started is an interest and some time. Finding a great tour company is always the best way to see if dog sledding is for you. If you enjoy your time and you want to pursue it more seriously, there are a wealth of resources available in and around Anchorage where you can learn more about the intricate details and requirements of the sport. Dog sledding is a great way to spend time with family, friend, and loved ones, and guided tours from experienced professionals are a safe way to get started and to see if you want to pursue this hobby more fully. Sledding allows you to experience nature, relax, have an adventure, and honor Alaska’s indigenous culture all in an afternoon, and could develop into a rewarding lifetime hobby and passion.